Outside of working and skiing, Meredith can often be found at the Aspen Club, where she is a devotee of High Intensity Interval Training (Hi2T). Or at a meeting of the Aspen Young Professionals Association (AYPA) where she is the public relations chair. Skiers the world round know about the snow, the nightlife, the terrain of Aspen/Snowmass, and Meredith McKee is one of the reasons why. As the ski areas' public relations and social marketing manager, she is out on the hill almost every day telling the resort's story—perhaps in front of the camera ripping Highland Bowl to get the message out that another 9" of powder fell overnight or behind the scenes herding 5 a.m. snowmobile rides at a Nike shoot. Maybe she's serving up a Lemongrass Mojito to a New York-based food writer sampling what's new at the Ajax Tavern. 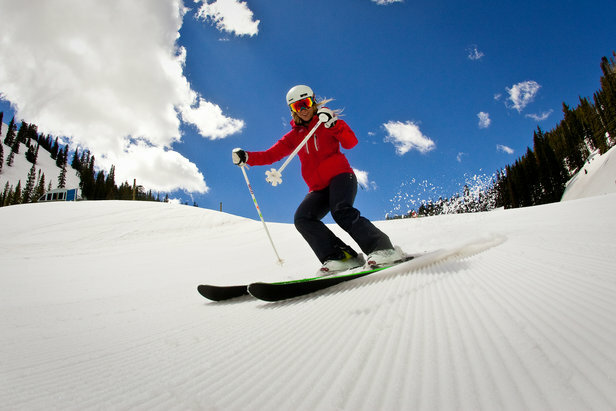 Meredith knew early on that she wanted to find a home in the ski world. She grew up in Golden, where her ski-loving dad had her shredding front range ski hills when she was just 3 years old. The pair got out every chance they could, and Meredith caught her dad's contagious passion. So, years later, when she was studying journalism at the University of Colorado, she leapt at an opportunity to intern at Freeskier Magazine during her senior year. That position led to another internship, this time at an Aspen-based PR firm. Once in Aspen, she knew she wanted to stay and work for the resort. So, when a job opened up in the PR department, she seized it. That was in October of 2006, and she hasn't looked back.